This transformation turns a function into an interpreter, whose bytecode language is specialized for this function. The transformation has been designed to induce as much diversity as possible, i.e. every decision made is dependent on the randomization seed. The diversity is both static and dynamic, i.e. each interpreter variant differs in the structure of its code as well as in its execution pattern. For this transformation, Tigress first constructs type-annotated abstract syntax tree (AST) from the C source, from which it generates control-flow graphs of instruction trees. Tigress then selects a random instruction set architecture (ISA) and, using this ISA, generates a bytecode program specialized for the input function. Finally, Tigress selects a random dispatch method and produces an output program. instructions can be made arbitrarily long (with highly complex semantics) through the use of superoperators. Dynamic diversity. We ensure that dynamic execution patterns are diversified by merging randomized bogus functions with the ``real'' function. We can furthermore impede dynamic analysis by making instruction traces artificially long. Static stealth. Not only diversity but also stealth is important for interpreters. 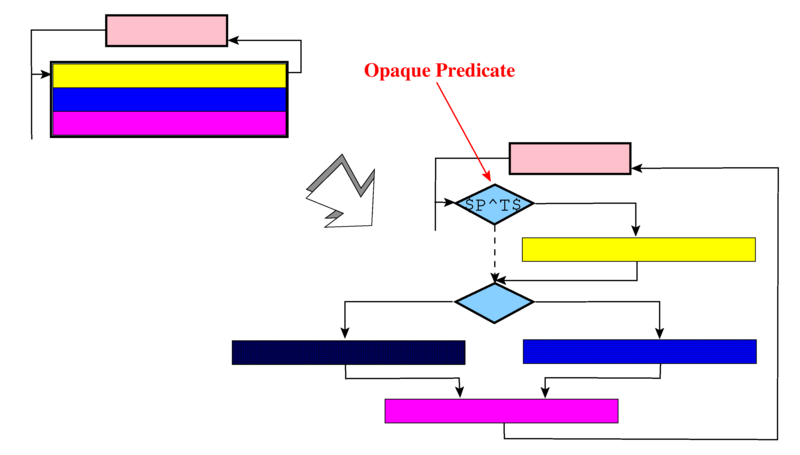 For static stealth, the split transformation can break up the interpreter loop into smaller pieces, and the AddOpaque transformation can make instruction handlers less conspicuous. Dynamic stealth. 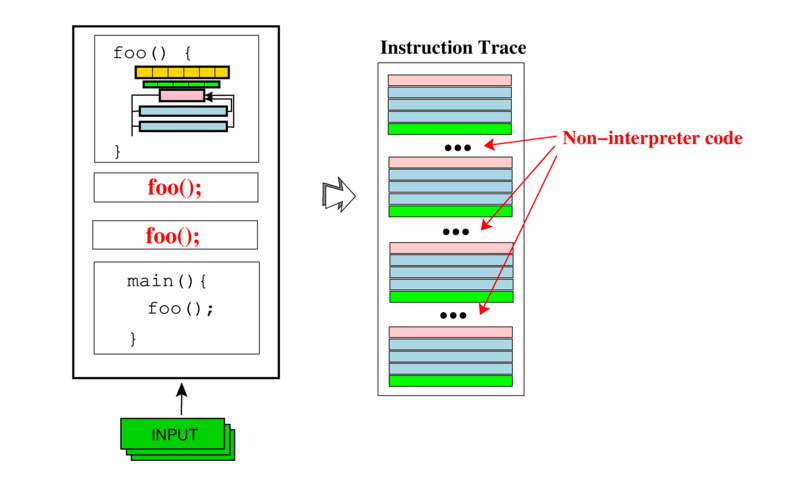 For dynamic stealth, Tigress interpreters can be made reentrant, meaning only a few iterations of the dispatch loop are executed at a time, effectively mixing instructions executed from the interpreter with instructions executed by the rest of the program. This is of particular interest when wanting to hide the execution pattern from analysts, and when the exact time that the function executes is not important, as long as it completes eventually. You can split up the generated interpreter by inserting opaque predicates. This is useful to make the instruction handlers and the dispatch logic less conspicuous. Make interpreters that can execute a few instructions, return, and later resume to execute a few more instructions, until, eventually, they terminate. This is particularly useful when it is not important exactly when the a piece of code executes, as long as it executes eventually, and where the stealthiness of the computations is paramount. "-10" here means to initialize foo and execute 10 instructions. Here you can pass whatever arguments you want to foo, they won't be used. Rather, the ones that were passed in the first call will be used throughout. "10" here means to resume foo and execute 10 instructions. Additional calls to foo once termination has been reached is safe; no additional instructions will be executed. It is a good idea to combine reentrant interpreters with superoperators. Superoperators produce long instructions that perform more work during each iteration, and as a result the number of dispatches (i.e. loop iterations) is reduced. In other words, if you want to frustrate dynamic analysis that looks for evidence of the dispatch loop in the instruction trace, superoperators combined with reentrant interpreters will reduce the presence of such artifacts. This does not work for --VirtualizeDispatch=direct. --VirtualizeOpaqueStructs=input,env ensures that the program array will be encoded based on these command line invariants. If the program is invoked with a set of command line arguments that violate the invariants it is likely to crash. Setting --VirtualizeDynamicBytecode=true results in the program array being constantly modified at runtime, much in the same way that happens to jitted code in the JitDynamic transformation. In fact, exactly the same mechanisms are used for both transformations, and they share all the same options. Virtualize fib in test1.c using two levels of interepretation. 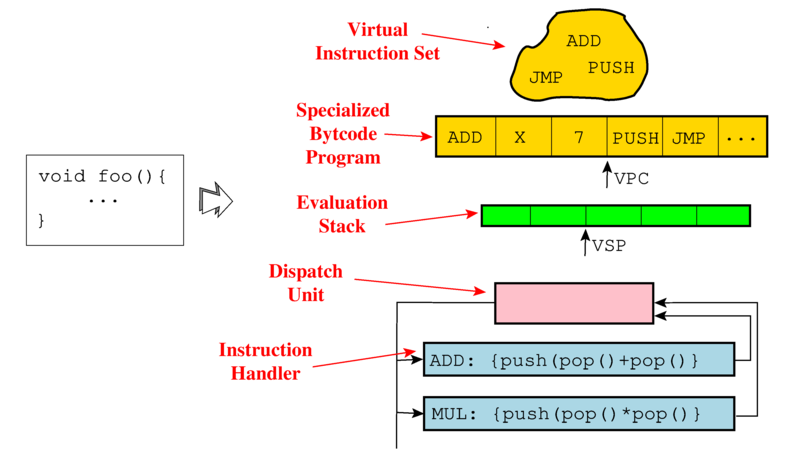 Virtualize fib using a switch dispatch, register and stack arguments, at most two instruction variants of each kind, and superoperators of length no more than 10. 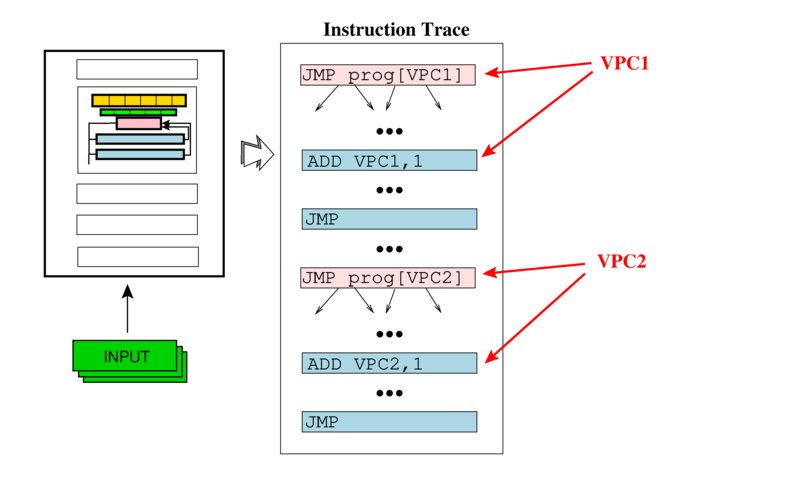 Virtualize fib using an interpolation dispatch, running a bogus function in parallel (to thwart virtual PC pattern matching attempts), and inserting bogus computation between instruction executions (to increase the length of instruction traces). Virtualize fib twice, calling Tigress twice from the command line. Use the --FilePrefix option to avoid name clashes. Virtualize fib, and split up the resulting function in order to make the dispatch loop more statically stealthy.